We update our barometer and tactical positioning for June. 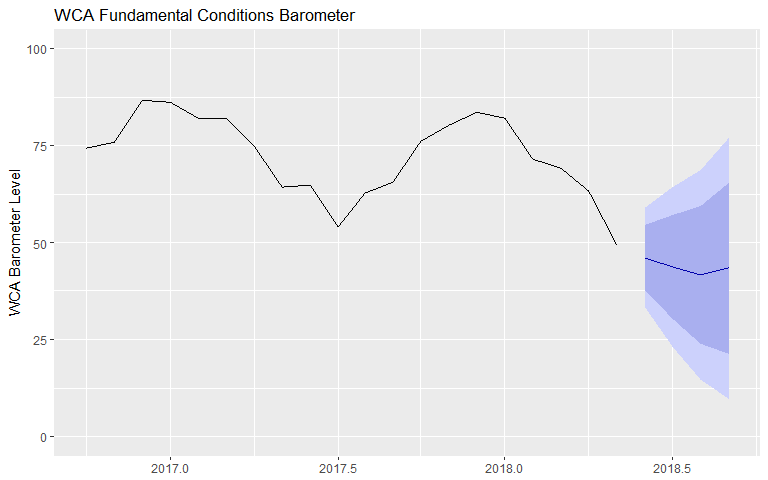 Our forecast path for the WCA Fundamental Conditions Barometer declined in June (chart, below), and now sits just below 50. The decline in the index from above 70 at the start of the year suggests that risk appetite has waned somewhat. Accordingly, we trimmed back the equity exposure in the satellite portion of tactical portfolios to 45% from 55% last month. A closer look at the data shows some evidence of softening in Europe, a build in domestic inventories, wider credit spreads, and some weakening of Asian financial conditions. None of these trends mark significant stress, but no longer do we see clear signs of improvement either. Instead, the evolving picture in 2017 is a more muddied one. One possible culprit is the U.S. dollar. Since April, we have seen the dollar rise versus the Euro and on a trade-weighted basis. This is a marked shift from the general trend of 2016-2017 where the dollar’s value fell. This change in direction is important because we saw improving fundamental conditions during the 2016-2017 period of dollar weakness. The “reflation” trade began in early 2016 and contributed to rising commodity prices, falling stress in emerging markets, and higher global growth. Because the “reflation” trade relies on a weak dollar, the shift to dollar strength hurts one of the pillars of the bull case for global growth. It also could cut short the commodity rally which boosted commodity based exporting emerging markets and sectors tied to rising commodity prices. What Changed the Dollar’s Direction? A shift in policies in the United States could lie at the heart of the change in dollar direction. Since April, we have seen monetary policy become less accommodative, and fiscal policy has become more expansionary. Under this scenario, we might expect to see a stronger dollar. Just last week, we saw the Federal Reserve (Fed) raise rates in the United States. According to the Fed’s own projections, near-term economic growth is expected to be higher than long-run sustainable growth. Projections for 2018 growth were increased to 2.8% from 2.7%, which is higher than the committee’s 1.8% long-run growth rate. This supports a move toward tighter policy. Back in April, we learned that the 2019 federal budget deficit is expected to be nearly $1 trillion, a 50% increase from 2016’s deficit. This increased deficit is seen as expansionary in the near-term as it involves both lower taxes and greater spending. The tailwinds of reflation, low interest rates, and tax cuts fed a 40% rise in the U.S. stock market and lifted global growth the last two years. This good news has been recognized by financial markets and contributed to a surge in U.S. household wealth to over $100 trillion. At some point, we would expect to see some “settling down” which can be seen in the return of our WCA Fundamental Conditions Barometer to levels near 50.